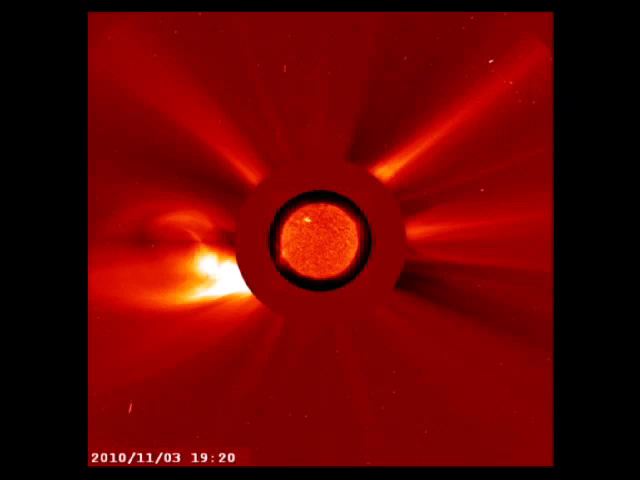 We are happy to showcase here a movie clip produced by an outreach enthusiast that shows a year and a half of the Sun's activity (Jan. 2010 to July 2011) in just over three minutes as the Sun emerged from solar minimum to more consistent activity. As part of the Royal Astronomical Society of Canada Calgary Centre's astronomy outreach program, Larry McNish decided to generate this combination of LASCO C2 and EIT 304 frames. With a constant time interval of a frame every three hours, the movie presents 3.75 days per second; thus, things appear to happen very quickly. Jorge Quintero is the composer of the "300 Violin Orchestra" music provided as the sound track. And so, courtesy of Larry McNish, we can offer it to you.